When is it safe to put a baby in a walker? Infants and babies grow like weeds, and since the development of children varies, determining when it is safe for them to put in a walker varies. 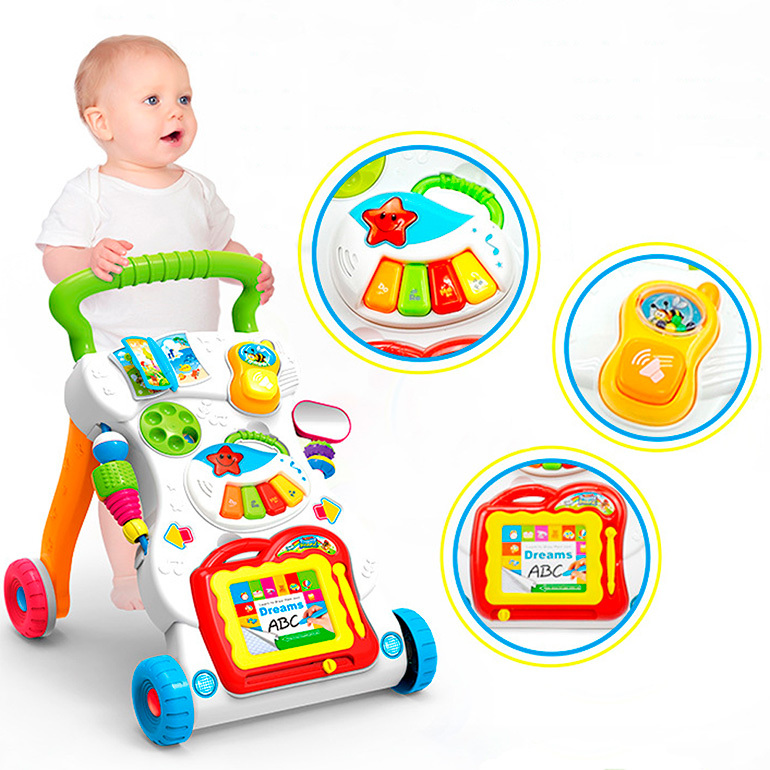 Wheeled devices and baby walkers allows babies who can’t walk yet to scoot themselves around the house or backyard by pushing their feet on the ground. Unfortunately, The United States Academy of childcare specialists say that baby walkers are dangerous and should be banned. They also claim that baby walkers can hinder normal development like walking and crawling. Despite that, baby walkers are still used and are quite common. People buy best baby push walker because walkers are said to help increase mobility, and some parents believe that the walker will help walking become easier for the baby. But according to medical studies and research, the opposite seems to be true. After reading this article you will know for sure if using a walker is a good idea for your child. The walkers themselves hold a few risks, toes and fingers can get stuck in the metal hinges that allow the device to collapse. If the infant sits up in the walker, it’ll give them acess to things they wouldn’t normally have access too. In addition to this, walkers can fall into pools, down the stairs and run into other dangerous areas and the walker moves three feet in a blink of an eye, so parents have less time to react before it’s too late. Some parents say that a little risk and danger is okay for their child, but the risks that walkers carry can be huge. In fact, in 2013 it was reported that thousands of babies in the United States got injured from using walkers. In the early 1900’s a study lead by writer A.C Siegal of the Development of Department of Psychology at Case Western Reserve University said in the “journal of Development and Behavioral Pediatrics” that Babies who used walkers got worse scores on the Bayley scales of motor and mental development ( a standardized assessment test for babies) and they also walked and crawled later than babies who didn’t use a walker. The baby needs be able to hold their head up independently and have their feet touch the floor. Normally babies are able to crawl and use a walker at around six or seven months. Some babies as young as 4 months can use a baby walker. Remember, walkers are made for babies to 4 to 16 months. As recommended by Eva Baby Gear, Do not allow your baby to use a walker if they are already walking because this could hinder their development and increase their risks of being injured. In addition to this, your baby must be able to figure out how to use their feet to push themselves around. In this Do you plan on buying your baby a walker? Do you own a walker? Tell us in the comment section below and don’t forget to follow us and share us with other parents!